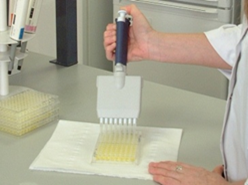 Detection of specific antibodies in the serum of animals is recognised as a useful indicator of previous exposure to pathogens. AquaMab-F antibodies enable the detection of IgM by ELISA in a wide range of fish species used in aquaculture. This is extremely useful for broodstock health testing. It also provides tools for monitoring the immune response in fish following vaccination and therefore will assist in the development of vaccines in the future as the more fish species are cultured and new diseases emerge. If you have new fish species and need an antibody to detect the IgM please let us know. We may have an antibody to suite you. Antibody conjugates (AquaMab-C) are also available for selected fish species where the antibodies from the AquaMab-F range have been chemically linked to horse radish peroxidase (HRP).